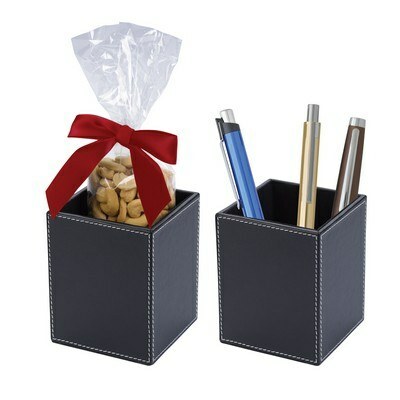 The Faux Leather Pen Cup Set features 5 ounces of tasty treats, Customizable with brand details. Give them the special treatment with our Faux Leather Pen Cup Set! Serve them delicious, rich chocolate almonds inside a beautiful canister which they can actually reuse. This pen cup is covered in faux leather and is ideal for holding pens, pencils, office supplies or candy. A generous 5 oz bag of high quality cashews packed in clear plastic bag and decorated with ribbon makes an appealing gift for any client. With your brand logo printed on the pen cup, this gift guarantees long.jpgasting corporate exposure even after the treat is eaten up. Your promotional message stays on their desks as a convenient accessory holder. A great choice for food gift to appreciate or thank your customers!